For the last few years, I was teaching startups to think like designers. But I eventually realized that you need someone to model and inspire design thinking within the company. Designer Fund’s Enrique Allen writes about the aha moment when he realized designers should be involved in the foundation of start-ups, and he makes some very insightful points about why design is important to the tech world today. There’s not much we can say on the importance of designer founders that Allen doesn’t cover in his well written, inspirational article—so read it. 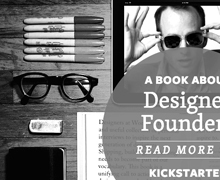 We’ll post more soon on the Designer Fund and the Funds’ project, Designer Founders, a non-profit book that presents a collection of interviews with designer founders who have created venture-backed tech startups. We’re interested. *Allen and Koczon both caution that not all designers should be founders of course—just those that can do everything, do it well, and aren’t afraid to put a prototype out there that isn’t perfect. More burning and less kerning, perhaps?